The paper entitled Performance Evaluation of Active Chilled Beam in Real Office Conditions in a High-Performance Building in Heating by MASc Rohit Upadhyay has been selected to receive special recognition at the ASHRAE Conference, in Atlanta, January of 2019! After the ASHRAE Conferences and Expositions Committee has reviewed all of the approved conference papers written by students, the Committee has determined that Rohit’s paper is deserving of recognition. Building performance is increasing in priority, and the tools to predict it are becoming more accessible. So why isn’t energy modeling used in every project? Energy modelling/simulation has demonstrated to bring high value as a decision-making tool to support building design and capital retrofit decisions. The building industry is gradually maturing to understand its value and learning to maximize its benefits as a collaborative tool towards building sustainability. Read the article from the Architect Magazine by the American Institute of Architects… And the payback of energy modelling is extremely short. The discipline of Building Energy Modelling and Simulation has reached a level of maturity to be able to proactively support design decisions. 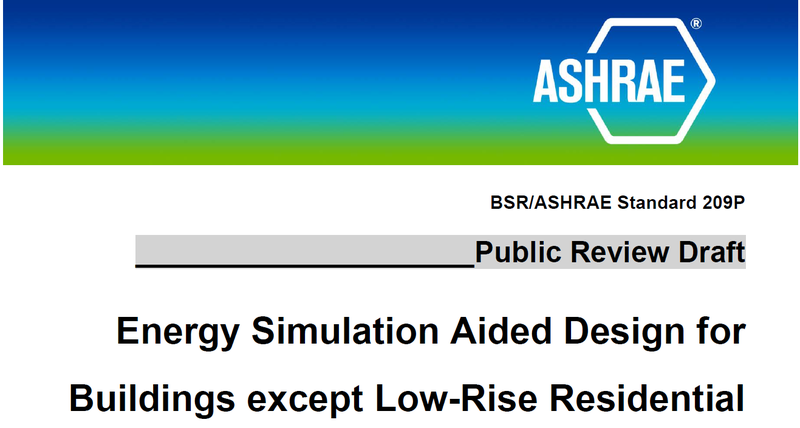 This is attested by the proposed new standard BSR/ASHRAE s209P Energy Simulation Aided Design for Buildings except Low-Rise Residential Buildings. Competent Building Energy Modelling Professionals, trained at BCIT’s Graduate Certificate in Building Energy Modelling, are therefore in a prime position to influence design decisions towards building sustainability. Apply now! Residential indoor air pollutants: where are the priorities? In the study acrolein and PM2.5, along with the well known formaldehyde, second hand smoke and radon, are the primary pollutants of concern. Really? This is not about INDOOR air quality but keeps showing up in international news. Also, the index of focus PM2.5 is the worst and most invasive kind of particles because they can infiltrate deep into the lungs and bloodstream. CBC http://www.cbc.ca/news/world/story/2013/01/12/beijing-pollution.html indoors is people’s last reservoir for clean air. Article on The Economist http://www.economist.com/blogs/analects/2013/01/beijings-air-pollution << have to cut and paste URL for some reason. Some environmentalist lobby group may oversimplify the problem and say “it’s easy, they just have to switch from coal to electric or wind power and change to electric cars”. – because electricity and wind power are still expensive and also electric cars; furthermore, these are not the most efficient systems and are still pending development. No easy solution. Or is there?? The building sector contributes up to 30% of global annual greenhouse gas emissions and consumes up to 40% of all energy . Accordingly, the building sector has the greatest potential for climate change mitigation . The development of mitigation and adaptation strategies has become a major challenge for the building industry. These strategies are, of course, local climate and environment dependent. Prime mitigation strategies are: 1) improving energy efficiency of new and existing buildings, 2) integrating renewable energy technologies, and 3) using earth-friendly materials. Adaptation involves making buildings more resilient and responsive to extreme events and weather fluctuations. Any thoughts on adaptation strategies and the role of building science? UNEP-SBCI. Buildings and Climate Change – Summary for Decision-Makers. United Nations Environment Programme (UNEP) and Sustainable Buildings and Climate Initiative (SBCI) 2009. IPCC. Climate Change 2007 – Mitigation of Climate Change. Working Group III Contribution to the Fourth Assessment Report of the Intergovernmental Panel on Climate Change (IPCC) 2007.